Is this Oswald's Wedding Ring? Is This Lee Oswald's Wedding Ring? Lee Oswald and Marina Prusaakova were married at ZAGS (the marriage bureau) in Minsk on Sunday, April 30, 1961. 1. "Marina later made a terrible discovery. She happened to glance at the bureau and saw that, again by a miracle of oversight, the police had left another of her possessions behind. It was a delicate little demitasse cup of pale blue-green with violets and a slender golden rim that belonged to her grandmother. It was so thin that the light glowed though it as if it were parchment. Marina looked inside. There lay Lee's wedding ring." 2. Marina Oswald stated that her husband woke up about 7:00 a.m. on November 22, 1963, and uncharacteristically left his wedding ring behind when he went to work at the Texas School Book Depository. 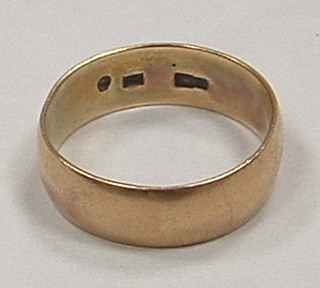 The wedding ring was found in the home of Ruth Paine, after the assassination. RANKIN: Had your husband ever left his wedding ring at home that way before? MARINA: At one time, while he was still in Fort Worth, it was inconvenient for him to work with his wedding ring on and he would remove it, but at work - he would not leave it at home. His wedding ring was rather wide and it bothered him. I don't know now, he would take it off at work. RANKIN: Then this is the first time in your married life that he had ever left it at home where you live? 3. In one FBI interview Marina Oswald stated "that the following day (Friday) when she got up from bed, after the departure of her husband, she noticed his wedding ring laying on the top of their bedroom dresser." 4. In another FBI interview she stated "that she had not discovered Oswald's wedding ring on the dresser in her room at the Ruth Paine home the morning of November 22, 1963, upon getting up that morning. She said she had not seen it until the police came to her house to search it, following the arrest of Oswald on November 22, 1963." 5. In yet another interview she said "She remembered that Oswald had on his marriage ring on the evening of November 21, 1963. Marina advised that on November 22, 1963, when the police came to the Paine house and searched it, they found Oswald's marriage ring on a dresser in the room which she, Marina, used. She said she had not seen his ring on the dresser before that. She advised the last time she had seen the ring was on the hand of Oswald the evening before." Tom Bargas (Superintendent of Leslie Welding Co. in Fort Worth, TX.) told the FBI: "...he knew Oswald was married only because he noticed this fact on Oswald 's employment application." The FBI took note of this: "In the same report, Gopadze reported that Marina said she noticed Oswald wedding ring lying on top of her bedroom dresser when she got up from bed on the morning of November 22, 1963. This is in direct contradiction to statements Marina has made to us - these being that she did not know Oswald had left his wedding ring until after the police found it." Oswald was buried at on November 25, 1963 at Rose Hill Cemetery in Fort Worth. Linda E. Norton, MD conducted the exhumation autopsy. "Upon entry into the casket a moderate malodor emanated from the decomposing body. As measured in the casket from superior skull to heel region on the left, a body length of 177cm (69½ in.) was obtained. A gold wedding band and a red stone ring were removed from the fifth digit of the left hand (subsequently identified by Mrs. Porter as representative of items placed upon the body at the time of initial burial)." Originally I believed the ring in the possession of Attorney Luke Ellis of Brackett & Ellis of Fort Worth, TX was the wedding ring removed by Dr. Norton. I thought a member of the firm, Attorney Forrest Marquart, had appeared with Marina at the exhumation autopsy. When I visited the law firm I found documents showing that Marina was using the firm's services in 1964 - after the burial but well before the exhumation autopsy. Marina went to the law firm in 1964 to sign documents (for example: the contract with Priscilla McMillan and publisher Harper & Row for the book that would become Marina and Lee.) and at that time presented the ring to Attorney Marquart. Receipt is hereby acknowledged of a gold wedding band which had been turned over to the United States Secret Service on December 2, 1963 by Mrs. Ruth Paine. I surmised the law clerk that received the ring, transcribed Marina's comment that this was the ring that Ruth Paine turned over to the Secret Service on December 2, 1963. The Secret Service then gave it to Marina who brought it to the law firm as payment for services. "The lid was raised. Forty reporters peered over the (police) officers' shoulders. Marina, who had been following TV and was learning about images, kissed her husband and put her ring on his finger." It would seem Marina put HER wedding ring on the body only to retrieve it years later at the exhumation. And this means the ring in the law firms possession is Lee Oswald's wedding ring. A special thanks to Daniel Murph for sifting through the Warren volumes and FBI transcripts for references to the ring.